Pre-inspection real estate cleans. Based in Manly, Queensland, we service all homes and businesses in the Brisbane area. Whether you’re a tenant, landlord, or homeowner our professional exit and entry clean will relieve the stress of moving and give you total peace of mind. Get your bond deposit back. Pass your rental inspection with our spotless bond cleaning. Achieve the best price from your property sale. Moving house or apartment is always going to be a stressful experience. By hiring professional bond cleaners, you can free up some time to help you get settled in your new residence while our professional bond cleaners work their magic. Moving out of a rental or leased property? Do you need professional help to clean your entire house or apartment after a tenancy period? No problem! Here at Count On Clean you can rely on our end of lease cleaning service (also known as “rent cleaning”, “vacate cleaning” or the “exit clean”) to ensure your home or workplace is in the best possible state to pass any real estate inspection and create a home that’s suitable to re-let again. Moving houses or apartments can be incredibly stressful. Whether you’re a tenant or a landlord there’s always too much to do – let alone having the worry of ensuring that your property is totally clean throughout. As one of the leading bond cleaning companies in Brisbane, Count On Clean can take away the stress of end of lease cleaning. 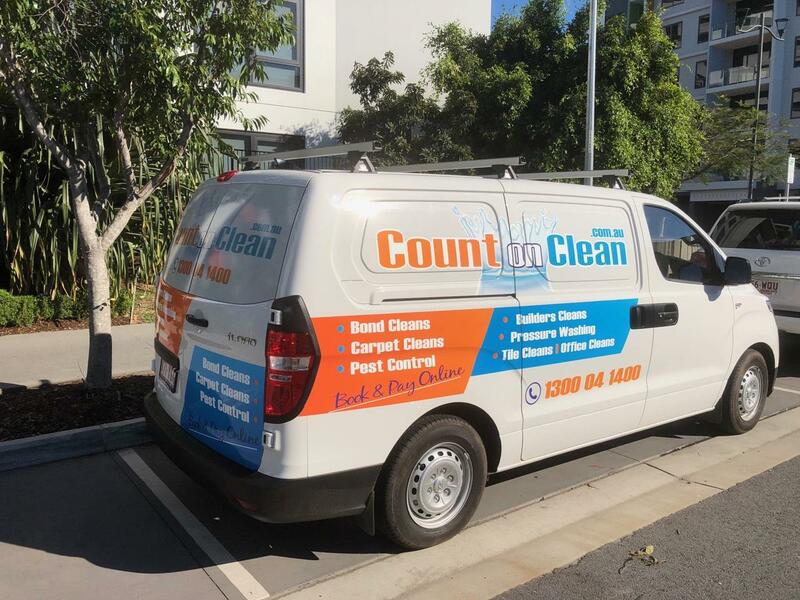 Whether you’re in need of a full-blown property clean or a tenancy blitz clean, the expert team at Count On Clean is available to clean, so that you don’t need to. Our cleaners are carefully hand-picked and chosen for their commitment and enjoyment of the job satisfaction they get from cleaning. Highly trained and fully armed with the very best products and equipment for the job in hand, they’ll clean your property from top to toe – even those forgotten areas that haven’t been cleaned in months! Are you selling a property? Count On Clean will clean your home or office to the highest real estate cleaning standards to help you get the best possible price. When you’re thinking about selling your property, be it residential or commercial, you’ll need to start getting it ready as soon as possible. Selling a property in today’s competitive real estate market can be made easier by ensuring that it’s both aesthetically attractive and fully functional. It’s not just enough to offer the lowest price on the block, to sell your property it needs to stand out from the crowd and look it’s very best. A deep-down thorough cleaning job will work wonders on any property you’re looking to sell but it can take several hours and a lot of physical effort to get the job done right. By using a professional pre-sale property cleaning service, you can alleviate the stress and have peace of mind in knowing that our experienced cleaners are focusing not just on the areas that can be seen but all of those hidden corners too. They’ll leave your property gleaming. Contact us today for a FREE cleaning quote or give us a call on 1300 041 400. Moving into a newly constructed property is an exciting time as it gives you the opportunity to put your own stamp on it right away. However, arriving to find it looking like a construction site rather than a finished building probably isn’t what you were hoping for! Thankfully, you can rely on Count On Clean to provide the perfect solution. Our experienced entry cleaners based in Brisbane, specialise in initial cleaning once construction has ended and will remove all signs of the construction site from your building, be it residential or commercial. It’s an essential step to take before renting, leasing, selling, or moving in, and leaves the property ready for occupancy. All of our cleaners are fully covered by our comprehensive insurance and are chosen because they enjoy cleaning and take pride in their work. We make the transition an easy one by removing all residue, debris, and rubbish before giving the property a thorough clean. Covering all greater Brisbane locations, Gold Coast and Sunshine Coast, we can adapt to practically any type of business and budget. Contact us today for your FREE entry clean quote. What Exactly Is Bond Cleaning? Bond Cleaning is the process of completing the Rental Association’s checklist for exit cleans in Queensland. It generally makes an apartment look as good as when you moved in so that you get all of your bond back. In Brisbane, many landlords make it compulsory in your lease that you get a specialist bond cleaner to do the job as a condition before you can hand the keys in. Regardless of what your lease states it’s essential to return the property in a clean and tidy condition in order to get your bond money back. Ensuring the property is clean before handing back your keys is a universal obligation which is typically interpreted as including any repairs or maintenance work necessary to return the property back to it’s original condition when you moved in. Bond cleaning is hard work and requires a good eye for detail, which is why your best option is to hire a reputable professional bond cleaner to do the work for you. Remember, the real estate agent will always want the best for the owner and any tenant will insist on the property being spotlessly clean before moving in. How Long Does Bond Cleaning Take? Our Bond Cleaning services take anywhere from 4 to 20 hours to complete, depending on the size of your home. If you have a small apartment and it’s in a decent condition we can sometimes get the clean turned around the next day. But if you need an exit clean for a larger property, it can take several days to get complete. What Do Bond Cleans Cover? We work through the exit clean checklist provided by the Rental Association to ensure that your property hits all the grading criteria that you’ll be marked upon. With thousands of Brisbane bond cleans completed we know exactly what rental managers are looking for. We cover your windows, oven, bathroom, walls, floors, cupboards, stove and much more. We don’t cover your carpet as a part of the bond clean in general. Bond cleaning can be a difficult, and time-consuming process for most tenants. While you’re in the middle of moving house, do you really have a spare 10, 20 or 30 hours to go from top to bottom across your entire place? Then, if things aren’t approved the first time, you’ll need to re-clean in order to get your bond back. We’ve heard horror stories of a tenant trying to do their own exit clean and it took them three 16-hour days straight for a 2 bedroom apartment. Nothing is worse than losing a large chunk of your bond because of marks or stains that you simply couldn’t get out yourself. Professional bond cleaners are experienced in removing the hardest stains, without damaging the apartment. This means your place will come up cleaner, quicker. The Queensland Rental Association has a clear checklist of exactly what needs to be cleaned as a part of a Brisbane bond clean. This checklist is exactly what your landlord will check against as they go through your property and grade the condition that you leave it in. For example, did you know that you need to clean the runners where sliding doors slide? Or that you need to clean the range hood vent to ensure the filters are clean? If not then consider using a professional exit cleaner so you don’t miss any bits. Unless you are equipped with professional cleaning materials, then chances are you will need to spend $80-$100 to get the supplies that are needed to effectively clean your home. These are products that you’ll likely only use once, yet you had to invest in to do your own clean. By getting a bond cleaning company to do the job for you, you don’t need to worry about having all the right tools. Nothing is easier when you are moving house than having your Brisbane bond cleaning all done for you. Simply making a phone call, and having a professional show up and do the job makes your life extremely easy. It means that you can focus on packing, moving, and then settling into your new home, without stressing about whether your place will be clean enough to pass a bond clean. Bond Cleaning is the process of completing the Rental Associations checklist for exit cleans in Queensland. It generally makes an apartment look as good as when you moved in so that you get all of your bond back. In Brisbane, many landlords make it compulsory in your lease that you get a specialist bond cleaner to do the job as a condition before you can hand the keys in. Our Bond Cleaning services take anywhere from 4 to 20 hours to complete, depending on the size of your home. If you have a small apartment and it’s in decent condition we can sometimes get the clean turned around the next day. But if you need an exit clean for a larger property, it can take several days to get complete. We work through the exit clean checklist provided by the Rental Association to ensure that your property hits all the grading critera that you’ll be marked upon. We cover your windows, oven, bathroom, walls, floors, cupboards, stove and much more. We don’t cover your carpet as a part of the bond clean in general. How To Book Your Bond Clean? Booking a brisbane bond cleaner is easy. Simply click on the ‘free quote’ button at the top of the screen and we’ll be in touch to give you an accurate and detailed quote for your job. Click here to get your free bond cleaning quote today! Why Choose Count On Clean For Exit and Entry Cleans? How Do I Book My Brisbane Bond Clean? Booking a Brisbane bond cleaner couldn’t be easier. Simply click on the ‘free quote’ button at the top of the screen and we’ll be in touch to give you an accurate and detailed quote for your job.